After experiencing the sudden passing of her father, Jacinta V. White found poetry to be her “life-line.” Years later, Jacinta started The Word Project as a way to provide urban youth a safe space to share their complex stories through poetry. Today, TWP reaches and works with those of all ages and walks of life who are looking to poetry and the arts as part of their healing journey. As director of The Word Project, Jacinta leads countless workshops and trainings and is called upon as keynote speaker for programs. She serves as a consultant to non-profits and has served as the co-creator and co-director of the LifeVerse Project, which received the Diversity Award from the National Library Association. To see other initiatives, visit poetryheals.com. Jacinta’s published work includes poetry in THIS Magazine (2015), Blackberry: a magazine (2015), New Verse News (2014), Typoetic.us (2014), Prime Number Magazine (2014), What Matters Anthology (Jacar Press, 2013), and Press 53 Open Awards Anthology (2008), as its first prize winner. 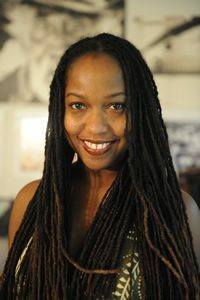 Her chapbook, broken ritual, was published by Finishing Line Press (2012), and she’s a contributor to My Soul to His Spirit: Soulful Writings of African American Daughters to Their Fathers (SoulDictates, 2005) and editor of Walking With God (Duncan & Duncan, 1996). Additionally, Jacinta is a NC Arts Council Teaching Artist. Jacinta makes her home in Winston-Salem, North Carolina, where she is very active in community enrichment.